Are the shaker style doors in this picture 2 pac or something else? These doors are sprayed in a Matt finish two pack polyurethane. 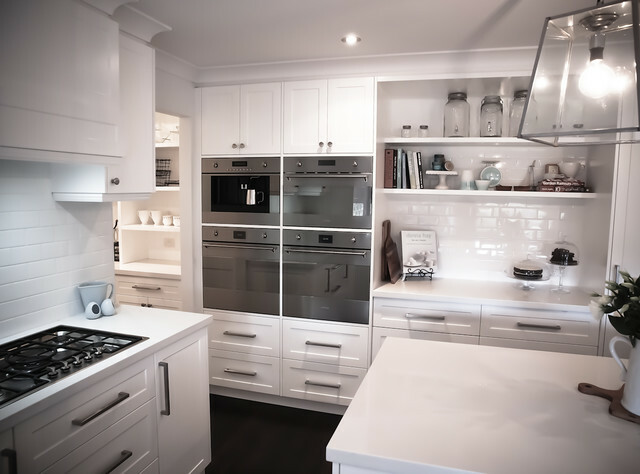 Top tips for mattIf you love the appearance of matt-finish cabinets, but are concerned that the whole look might be a bit too flat and boring, then consider these two ideas:Select a door that has a simple routed profile in it, such as the Shaker-style kitchen pictured here. The profile will cast different shadows on the cabinet fronts, creating a feeling of depth and interest. Mix two different colours together to create a contrast and a point of interest.